The Middlechurch Sustainable Community Plan is a Secondary Plan under Section 63 of The Planning Act. The Selkirk and Area District Development Plan (The District Plan) designates Middlechurch as one of several regional settlement centres to which the Planning District will be directing growth. The District Plan has identified the preparation of a Secondary Plan for Middlechurch as a priority. The Middlechurch Secondary Plan will provide implementation policies to guide infill and new development. It will also provide strategies and planning design guidelines to direct the integration of land use, transportation and municipal services with the social, economic and environmental goals of the Development Plan. The Secondary Plan has a 20 year horizon and incorporates into development review, sustainable development principles to lead and co-ordinate the conversion of the community’s current development pattern, based upon a mix of private services and unconnected neighbourhoods served by municipal services, into a more energy/cost efficient and green development pattern. The sustainable development pattern introduced by Middlechurch Secondary Plan applies principles of mixed use development and “complete communities” which provide places for people to live, work, recreate, shop and learn. The Secondary Plan will provide direction that will make clear the intended future use of land and how the public sector agencies may plan cooperatively with one another, with the community at large and with the private sector to achieve the Development Plan’s goals. The Middlechurch Secondary Plan is based upon the policies and sustainable development direction of the Development Plan. 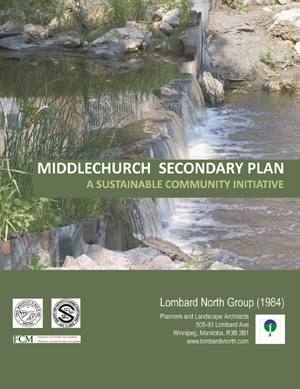 The Middlechurch Secondary Plan presents detailed policies and strategies to manage development within the Settlement Centre to achieve the community’s vision for Middlechurch and guide the phased extension of municipal infrastructure services including: waste water collection and treatment; storm water management; ensuring a safe potable water supply; and improving access to public transit to mature neighbourhoods, emerging residential neighbourhoods, mixed use neighbourhoods and commercial development areas. Please see links below to view all available documents.